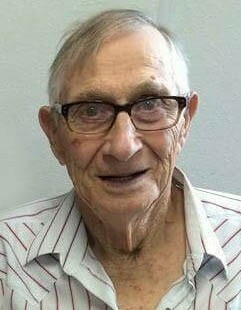 Royal Lawson, age 91 of Hoffman died Tuesday, March 20, 2018 at the Douglas County Hospital, Alexandria. Royal Raymond Lawson was born to Victor and Laura (Brown) Lawson in Wadena, Minnesota on August 8, 1926. Royal’s family lived in Wadena until he reached the age of two when they moved to Steven’s County, and in 1942 they moved to rural Hoffman. On April 30, 1952, Royal married Caroline (Steger) Lawson at St. Charles Catholic Church, Herman. They were blessed with three children, one boy, and two girls. Royal was a farmer where he took pride in his milking cows, and planting and harvesting his crops. He worked part time for the Soo Line Rail Road, and also did carpentry work. His favorite pastime was mowing the grass; and his favorite meal was a plate full of fried walleye. He cherished his time spent with family, especially his grandchildren and great-grandchildren. Royal is survived by his children, son Don (Pat) Lawson, and daughter, Carol (Joe) Martinson all of Hoffman; son-in-law, Mel Prahl of Sartell; 10 grandchildren, Jody Prahl, Sherri Prahl, Jenny Lawson, Kris Lawson, Jason (Taryn) Goodell, Cory Goodell (Magen Rapaway), Hilde Martinson, Josh Martinson, James Martinson, and Jeff Martinson; 7 great-grandchildren, Treyton Lawson, AJ Schumacher, Aubrey Goodell, Ellie Wallace, Canton Goodell, Alice Mealy, Mason Goodell, Kresyn Goodell. Proceeding Royal in death are his wife, Caroline Lawson; daughter Diane Prahl; parents, Victor & Laura Lawson; 8 brothers, Carl, Seth, Floyd, Lloyd, Larry, Russel, Kenneth and Glen, and 3 sisters, Gladys Auel, Violet DeRung and Vina Lawson. Memorial Mass: 11:00 AM March 24, 2018 at Our Lady of the Runestone Catholic Church, Kensington, with visitation one hour prior to the service.